On June 1, 2013, Honolulu participated in the National Day of Civic Hacking with its own Hack to the Future. Our event was attended by more than 80 people, which I might add was capped at 60. The day was designed to be an overview of applications and tools the community build around government open data from sites like data.honolulu.gov and data.hawaii.gov. It also consisted of presentations from government representatives from both the City and State. Dorreann Kaehuaea – Environmental Svc. Notes from the day are captured on the Hack to the Future Hackpad. One of the objectives for the event was to brainstorm ideas and to initiate team formation around potential projects. Several interesting projects include, infrastructure data collection, open tree mapping, neighborhood board project management tool, campaign spending data dive, homelessness icon design challenge and a neighbor island open data initiative. If you have any additional ideas, feel free to add them to the hackpad document. Thanks to everyone who came and participated in Hack to the Future. 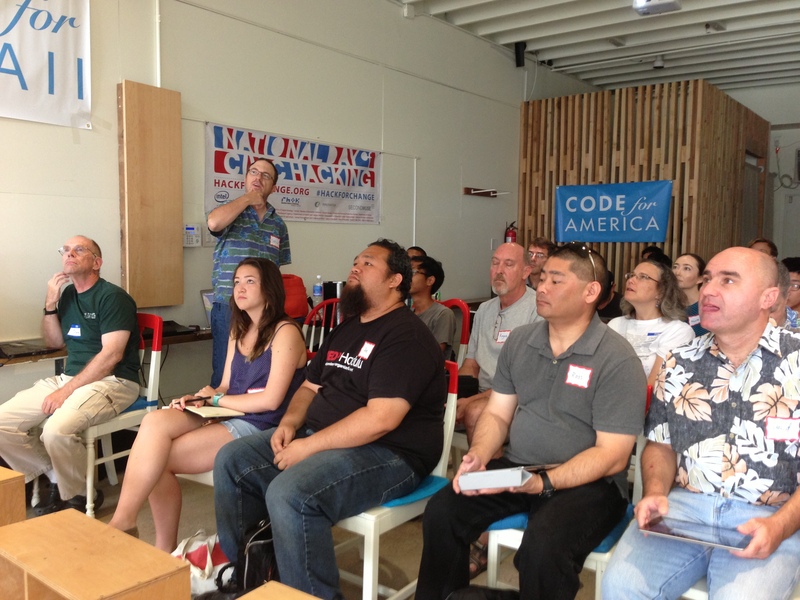 Special thanks to Code for America Brigade, Kathryn Higa and Interisland Terminal & R&D for hosting us. Here is coverage we got from KITV.